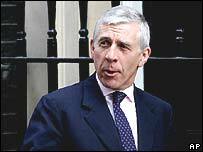 Prime Minister Tony Blair has described as "rubbish" claims he axed Jack Straw as UK foreign secretary because of American unhappiness with him. Mr Blair surprised many by moving Mr Straw from the high profile post in his wide-ranging Cabinet reshuffle. He switched Mr Straw to the more low-key role of leader of the Commons. Mr Blair said Mr Straw had done a great job as foreign secretary but was the best person for the "really, difficult" job of House of Lords reform. It had been suggested that Mr Straw's outspoken rejection of military action against Iran was at odds with the US line, which does not rule out any option on Iran. During the televised media briefing Mr Blair said Mr Straw's policies would not change under the new foreign secretary, Margaret Beckett. The prime minister said Mrs Beckett was an outstanding politician who was a "safe pair of hands" with much international experience.